WHO makes the LGBT top 10 global destinations list??? LONDON, UK (OUTNOW) — MAY 10, 2011 — Results of the largest market research study of its kind are released today – and the new report reveals – for the first time – which are the true gay tourism hotspots, right around the world…………A new study from Out Now Global for the first time reveals results from LGBT people living in 18 countries right around the world – to give a far more definitive and much more accurate global picture of exactly where LGBT people are planning to visit for their holidays in the next three years. With almost 40,000 respondents from this landmark study, Out Now’s LGBT2020 research is the largest study of its kind ever to be undertaken. As well as a comprehensive data set collected from the USA and Canada, the research also covered seven countries never before tested in the fast growing region of Latin America. For the rest of the article scroll down below the TOP 10 LIST…. Go RIO, Go RIO, Go RIO….it’s your birthday, it’s your birthday…..wops! Lost my happy mind for a moment! This is REALLY great news for Rio de Janeiro…..but no surprise! With over 100 bands to perform throughout the afternoon here in Santa Teresa this Sunday it will be a MUSICAL EVENT to he heard around the world! Here is much more on the specifics….if you are in Rio you MUST NOT MISS THIS!!! Festival Santa Musica-Uma festa popular, gratuita, aberta a quem quiser participar. Todos os estilos sonoros em alegre convivência. A celebração da música entre pessoas de todas as idades e origens sociais. Festival Santa Musica-A popular, free party, opened to who to want to participate. All the styles in joyful reunion. The celebration of music between people of all ages and social origins. We love the Rio Times……always keeping us updated on local events in English! 🙂 Here is a nice article on Santa that was in today’s edition. What is the weather like in Rio de Janeiro in June? 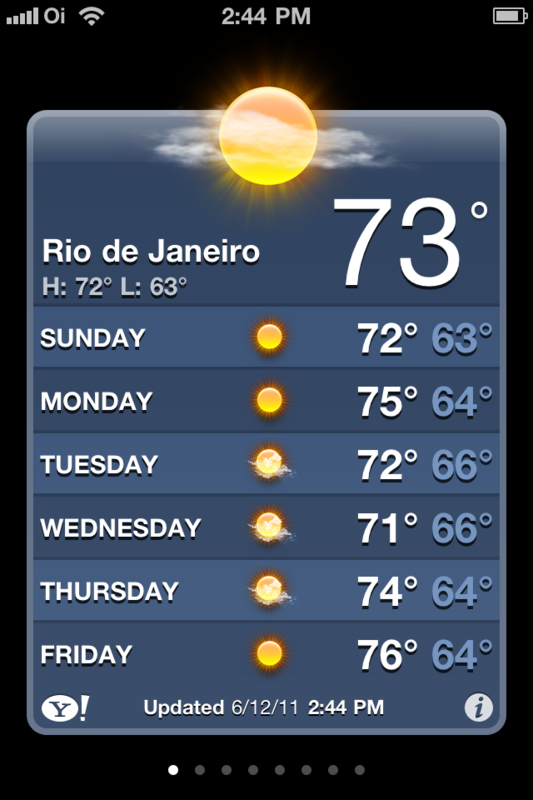 More or less the week forecast for June 12th, 2011 on my iPhone (below) shows our weather pattern here in Rio de Janeiro right now in June. Pretty nice right? 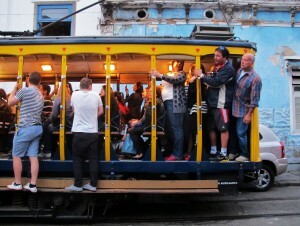 As David and I always say to each other, “Very San Francisco”. Catching up on reading my favorite magazine, New York Magazine, I came across this wonderful issue; APRIL 25th, 2011; “AROUND THE WORLD IN 156 PAGES; THE URBANIST’S GUIDE TO Paris, Moscow, London, Los Angeles, Bankok, RIO & Cairo”. On page 32- RIO-Speedo-less beaches, soap-star bashes, and very-late-night snacks. Broken down into ten sub-topics, all interesting and worth a glance….read on! Rio de Janeiro has always been Brazil’s greatest attraction: a city of gorgeous, gregarious, athletically blessed people that is almost impossibly draped over dramatic green hills along a coastline indented with beautiful beaches. It’s also a city of crime, chronic poverty, and deep-seated corruption. Like Brazil itself (whose stock market shot up more than 350 percent from 2000 to 2010), Rio is percolating right now; commercial rents, according to one assessment, are now higher here than in New York. Inflation’s on the rise too—but with the World Cup arriving in 2014 and the Olympics in 2016, the long-neglected port area being overhauled, three new museums going up, and even the crime-ridden favelas slowly coming under state control, the city’s feeling pretty good. It’s still no paradise, though it comes as close as any complicated metropolis of 12 million inhabitants ever could.